Five year moving average of the Arctic Sea Ice Index [red line] is inversely correlated to the Atlantic Multidecadal Oscillation [AMO] five year moving average shown in green. The AMO index "paused" right around the same time global temperatures "paused," perhaps related to solar control of climate and ocean oscillations. The AMO may now be entering a new ~30-45 year negative phase. 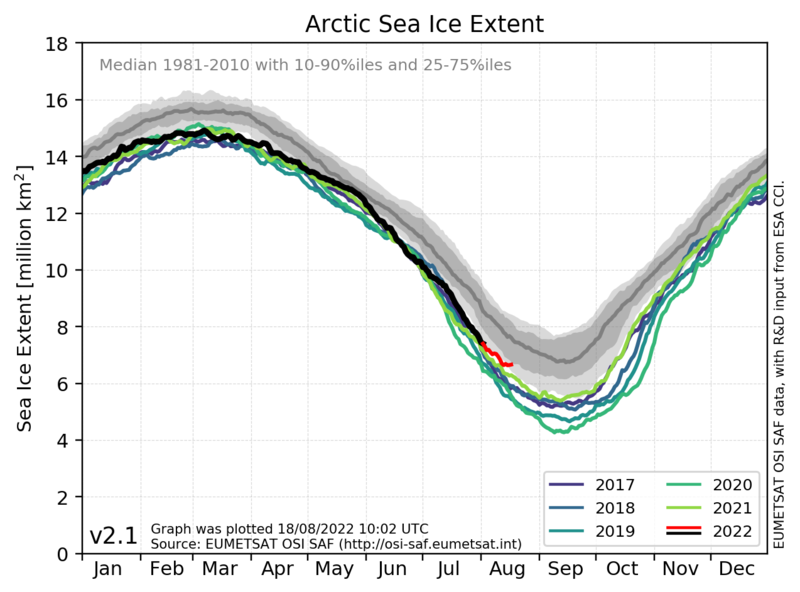 If this nutty denier theory is correct, Arctic sea ice could continue to recover for the next 30+ years of the negative phase of the AMO, even if you hang on to your dirty carbon-pollution-spewing SUV. Climate experts claim Arctic sea ice and just about everything else in climate is governed by a man-made CO2 "control knob" and most definitely not related to natural ocean oscillations such as the AMO (which in turn are controlled by solar activity), ocean warming from accumulated solar energy, and storm activity. A paper published today in Geophysical Research Letters finds Arctic sea ice extent is determined primarily by the natural ~60-90 year cycle of the Atlantic Multidecadal Oscillation [AMO], not greenhouse gases. According to the authors, "Arctic sea ice is intrinsically linked to Atlantic multidecadal [natural] variability" finding a ~60-90 year cycle of "Covariability between sea ice and Atlantic multidecadal variability as represented by the Atlantic Multidecadal Oscillation (AMO) index is evident during the instrumental record." The paper adds to many other peer-reviewed publications finding changes in Arctic sea ice are primarily related to natural variability of ocean and atmospheric oscillations, storm and wind activity, and not changes in greenhouse gases. Satellite data suggest an Arctic sea ice–climate system in rapid transformation, yet its long-term natural modes of variability are poorly known. Here, we integrate and synthesize a set of multi-century historical records of Atlantic Arctic sea ice, supplemented with high-resolution paleo proxy records, each reflecting primarily winter/spring sea ice conditions. We establish a signal of pervasive and persistent multidecadal (~60–90 year) fluctuations that is most pronounced in the Greenland Sea, and weakens further away. Covariability between sea ice and Atlantic multidecadal variability as represented by the Atlantic Multidecadal Oscillation (AMO) index is evident during the instrumental record, including an abrupt change at the onset of the early 20th century warming (ETCW). Similar covariability through previous centuries is evident from comparison of the longest historical sea ice records and paleo proxy reconstructions of sea ice and the AMO. This observational evidence supports recent modelling studies that have suggested that Arctic sea ice is intrinsically linked to Atlantic multidecadal [natural] variability. This may have implications for understanding the recent negative trend in Arctic winter sea ice extent, although because the losses have been greater in summer, other processes and feedbacks are also important. The AMO, PDO, and NAO have all been linked to solar activity as the driver [possible lunar tidal influence as well]. 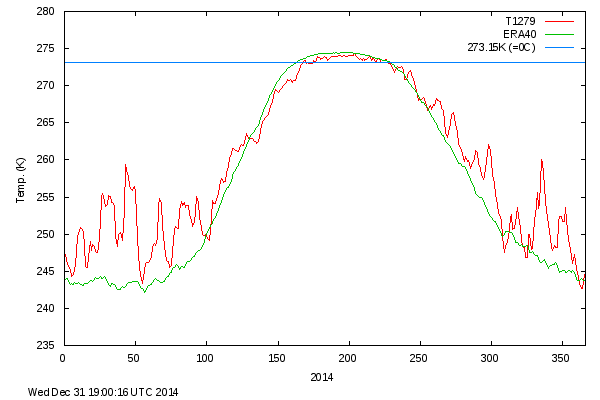 4th graph you've shown global sea ice where you've referred to it as Arctic ice. "The AMO is now entering a new ~30-45 year negative phase." Look on twitter under #wxAMO and #wxPDO I made lots of charts that clearly show the paper is right. Paper finds Arctic warmed at much faster rate 1910-1940 than 1970-2008 & "the Arctic temperature changes are highly correlated with the Atlantic Multi-decadal Oscillation (AMO) suggesting the Atlantic Ocean thermohaline circulation is linked to the Arctic temperature variability on a multi-decadal time scale."